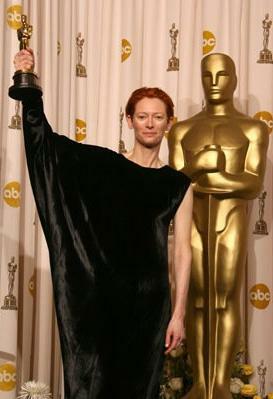 I went completely crazy when Tilda Swinton won the Best Supporting Actress Oscar on Sunday night. Jubilation crazy. Rhapsodic crazy. I have been sick since then, read a book since then, finished an essay, taught a class, attended a talk followed by a formal dinner, and written the same zillion e-mails that all of us write on Mondays in our jobs, and I have still found time to watch Tilda win seven or eight timesplus watching Markéta Irglova and Glen Hansard win three or four times, and Cate Blanchett grimace at her own Elizabeth scene twice. Of course I am ecstatic that the best performance in the category won, which for my money hasn't happened since Marcia Gay Harden in 2000 (although Rachel Weisz, very nearly as good as Amy Adams, might be close enough to count). But there is more to say, which will serve, at the moment, as my own complement to Nathaniel's wonderful and spirited retort to the insane allegation that the Oscars are somehow making a mistake by honoring the movies Hollywood admires rather than the movies the studios primarily banked on or the ones the wider public actually paid to see. 1. Tilda Swinton, Oscar Winner? I love the Academy Awards for pulling a surprise like this, not just in the sense that Tilda came from behind to win (which several prognosticators, including me, had started predicting at least a few weeks ago), but because here is a brilliant career that never seemed remotely Oscar-bound, and yet, here she is, ensconced in the Academy's admittedly spurious but hugely influential way in the annals of great popular acting. On my watch, Tilda would be a five-time nominee by now, with earlier Best Actress nods for Edward II in 1992, Orlando in 1993, Female Perversions in 1997 (when I would have had her win), and The Deep End in 2001, but I was well prepared to accept her avant-garde origins and her chiseled, androgynous pallor and her continued allegiance to out-there artists as a reason that she and Oscar would never sit down to lunch (whether or not George Clooney was hanging upside-down in the background). 2. The Archive Opens I love the Academy Awards for, however unwittingly, pointing cinephiles, especially budding ones, in the direction of work they might never actually see and that Oscar would never in a million years nominate. I have been on plenty of websites this season where people are clearly noticing Tilda for the first time because of the Oscar buzz, and then the nomination, and now the win. Since most Oscar obsessives I know came to our first flower of intensive back-catalogue renting and repertory-house screenings via the Oscar books, and then by moving onto the longer careers of nominees who most impressed us, I am beyond ecstatic that this public boost to Swinton's visibility and reputation will actually lead people to the above titles and Caravaggio and The Last of England and War Requiem and Blue and Love Is the Devil and The War Zone and Teknolust and Strange Culture (on DVD from Docurama at the end of March). Not to mention how many more will see Michael Clayton, or remember Tilda's great, small, Hollywood turns in films like Adaptation and Constantine. An indirect but no less indispensable function that Oscar serves within the wider ecosystem of popular film. 3. Against Nepotism Swinton didn't win for a single reason other than her performance, with the slight exception of Michael Clayton's shutout in other categories. Even there, plenty of well-liked nominees go home empty-handed every year (The Godfather Part III, The Prince of Tides, In the Name of the Father, The Shawshank Redemption, Secrets & Lies, The Thin Red Line, The Insider, The Sixth Sense, In the Bedroom, Gangs of New York, Seabiscuit, and Munich all had more or less comparable nomination tallies and went home with nothing). Otherwise, though, the critics didn't help her, beyond the rave reviews from several months ago: somehow, when prize season arrived, they only had eyes for Amy Ryan. She didn't have a Globe or a SAG. She isn't, remotely, a Hollywood elbow-rubber. She isn't "owed" in any way the Academy recognizes (and certainly not the way Ruby Dee is). She isn't the young thing of the moment. She didn't play a likeable character. She didn't play the character in a simply digestible way. Her part wasn't showy, though it was generously featured. The general public has a dim sense of her as the White Witch of Narnia, but little else. Why did she win? It's the performance, stupid, just like it was for Harden. Good enough to persuade voters on its own terms once they got around to seeing it, and good enough to qualify as the best winner in this category since the proximate wins of Peggy Ashcroft and Dianne Wiest in 1984 and 1986if not the best since Vanessa Redgrave won in 1977, and in virtually the same dress, plus a left sleeve. For all the well-earned reputation of insiderism and errant, delayed sentiment that the Academy has accrued over time, they don't always vote that way, and when they don't, it's glorious. Totally agreed. So many people were saying she'd win because they wanted to give Michael Clayton something, but since when has the Academy ever done that just for the sake of it. Well put. Tilda's win also has the not inconsiderable virtue that it won me £70, since I put a tenner on her at the last minute, and the bookies were all 7/1, slim chance -- ha! Champagne on me, Tilda. The best win in this category for aeons, I agree. I also LOVED the Cate grimace. Has anyone since Ethan Hawke looked more apologetic for being nominated? Yeah, the Cate grimace was classic (though there are certainly some since then that should have been just as embarassed *cough* Alan Alda *cough*). And if we saw these sorts of consolation to the film prizes, we'd have Oscar-winners Marianne Jean-Baptiste, Sophie Okonedo, and Kate Nelligan. Tilda got this award on her own, and rightfully so (though I'm one of the few who would have been all right with a couple of the other nominees). What I've been obsessing about is what was going through her mind when she looked at the statue and said, "Oh no." It's almost like she felt embarrassed to be accepted in this mainstream venue. That she had lost some outsider cred. Or maybe that she could already feel the backlash starting. (And it has -- all the Ziggy Stardust / sister-of-Conan-O'Brien jokes). For some of us, Tilda's win feels like *we* were granted a place at the banquet table, just for one night. I think it is a bit to do with Michael Clayton needing an award. I mean, look at Letters From Iwo Jima winning Sound Editing last year. There's definitely been a sense recently of spreading the wealth and making everything neat. Having said that, I think the main determining factor was that enough people got excited about her performance. Scanning blogs you could see the amount of people that recognised the greatness, and obviously that extended to elsewhere. I also think Tilda benefitted from a tight race, in which everyone had detractors (Cate's Aviator win, Amy Ryan's low profile, Ruby Dee's miniscule screen time, Saoirse Ronan's age/role etc.). Regardless of all this I really couldn't care less. It's a supporting performance worthy of the prize in any year. Nick, are you going to finish your honorees? Hi! I don't comment much here, but I read your blog regularly and I'm in an oddly generous mood this evening, so I wanted to say thanks for being so...wordy. At lot of the time I spend on the internet I feel as if I'm wasting my time when I could be reading or watching films or hanging out with friends, but then I'll read something you wrote and have to grapple with it and invariably I end up turning to a dictionary at least once, so I don't feel quite so guilty about internet usage. So, thanks! This is not related to this post at all (and is somewhat greedy) but when are you planning to restart the Picked Flicks list?